You can make bar shampoo using lye or soap base, depending on your preference. Making it with lye takes longer and is a little more difficult, but you have more control over what is in your soaps. However, this method can be dangerous, so, if you want to avoid it, you can do so very easily. Just remember to follow all measurements carefully, even when using a soap base. Place 4 ounces of distilled water and 6 ounces of coconut milk in a glass container. Measure out 4 ounces of lye using the scale, and slowly pour it into the water and milk mixture. This mixture gets very hot, so set it aside to cool to about 90-115 degrees. Measure the oils and place them into a kitchen pot (stainless). Use 9 ounces of coconut oil, 9 ounces of olive oil, 5 ounces of castor oil, 3 ounces of jojoba oil, 2 ounces of Shea butter, and 2 ounces of cocoa butter. Heat the oils until they have melted and mixed well. Allow them to cool to 90-115 degrees. Carefully add the lye to the oil mixture. Do not pour it too fast or else it could splash on you. Now, use a stick blender to blend all the ingredients together. You want the mixture to thicken and for trace – a line or ridge that stays momentarily before receding into the mix – to occur. When this happens, you can move onto the next step. You have to have trace in order for you to add all the soap additives. Now add in the essential oils and other additives. You can choose to add pigments and other herbs if you want. If you add pigments, it changes the soap’s color. This can be a fun experiment, but, to keep it as close to natural as possible, you do not need to add color. For essential oils, you should probably use 20 to 30 drops of the lighter scented oils, and then add 10-15 drops of the stronger one. In place of the oils, you can add fresh herbs. To do this, you’ll have to use a food processor to crush the fresh herbs. Pour the soap mixture into the mold or molds to harden. After 24 hours, you can remove the soap from the mold and start to cut it. After cutting, you should let the soap sit for another day or two to harden. If you are using a soap base, you can skip the first three steps. 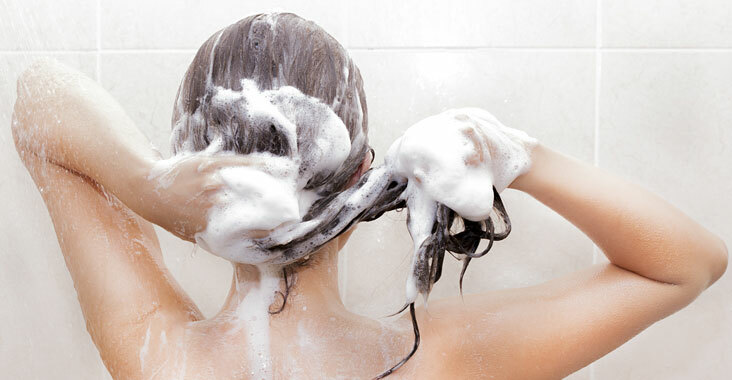 It is much faster to use the soap base, but, for this shampoo recipe, it may not work as effectively. This is because you have no control over the type and amount of oils in the soap. When you use this shampoo, it makes the hair silky and smooth, more so than anything you can buy in the stores. This makes it a cheaper and more effective alternative to traditional shampoos. Always condition with 1 part vinegar and 3 parts water after using the soap.